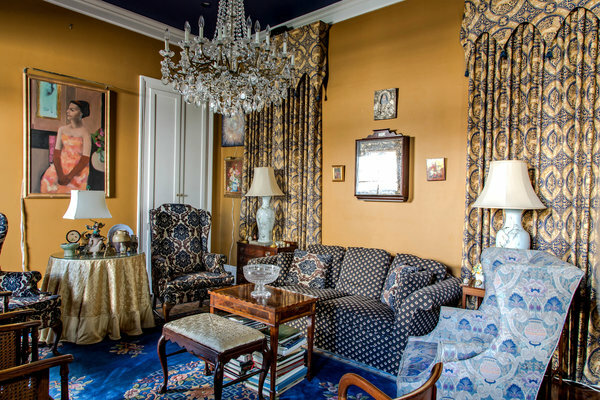 SETTING: This 1890s cottage is on a narrow residential block in an enclave of Uptown New Orleans characterized by colorful shotgun houses and late-period Victorians. Magazine Street, one of Uptown’s main thoroughfares, is around the corner. Within a couple of blocks are supermarkets, banks, cafes, restaurants, salons and other shops. Ten blocks up Magazine Street is Audubon Park and the adjacent Audubon Zoo, covering over 340 acres. Within the park, there’s a 1.8-mile jogging path, lagoon, playgrounds and tennis courts, shaded by massive live oaks. INDOORS: The house is a camelback, one story with a partial second floor. Most of its interior details, including millwork, crown molding, hardwood floors and fireplace mantels, are original. Ceilings on the first floor are more than 12 feet tall. Layout is side-hall, with a master bedroom suite at the house’s front end, followed by a living room with built-in bookcases, a kitchen and a formal dining room. The kitchen has a marble floor and appliances by Fisher & Paykel, Miele and Sub-Zero. Two additional bedrooms are upstairs; they share a bathroom. OUTDOOR SPACE: Off the back of the house is a brick patio, followed by a small arched bridge crossing over a fish pond to the backyard. SETTING: Madrid is a community of about 200 people in a narrow canyon of the Ortiz Mountains, 25 miles from Santa Fe. Miner’s cabins built in the mid-1800s are now residences, shops and art galleries; décor inside the Mine Shaft Tavern has barely changed since the late 1940s. This house is on a slope near the edge of town, overlooking Madrid’s main road. INDOORS: The main house is in a single-story adobe structure built as a Catholic church around 1902 and converted to a residence in the early 1990s. Hardwood floors are original, as are the tin ceilings. The nave is now the living room, with built-in bookshelves along one wall and a wood-burning stove. The former choir loft, over the living room, is now an office. The altar was converted to one of the two bedrooms; the sacristy is now the kitchen. During renovations, a master bedroom was added off the living room, giving the house a cross shape. The master bedroom opens to a porch overlooking Madrid. Off the kitchen, there’s a greenhouse-like bathroom with a sloped glass ceiling, wall planters, a shower and a six-foot-long claw-foot tub. At night, the owner sometimes sits in the bath and watches the constellations. The one-bedroom guesthouse, about 500 square feet, was built next to the church during renovations. Also on the property is a garage with an attached workshop and a small outbuilding fitted with a sauna. OUTDOOR SPACE: The sloping lot is more than two acres in size. On one side of the house is a landscaped area irrigated by graywater from a system connected to the claw-foot tub and shower. INDOORS: The two-story house was built in 1934. Four wood-burning fireplaces, wood-beam ceilings, and hardwood floors are believed to be original; other parts of the house — like the kitchen and bathrooms — were recently updated by the current owner. Off one side of the central foyer is a dining room with a cove ceiling; off the other is a living room with wood-beam ceilings and a fireplace. The dining room leads to a kitchen, which in turn leads to a family room via a hallway lined with built-in floor-to-ceiling bookcases. French doors in the family room open to the covered back patio. The master bedroom suite is off the living room, and opens to the back patio. The other four bedrooms are upstairs. One has an en-suite bathroom. Downstairs, in the finished basement, is a recreation room with a fireplace and a mosaic-tile floor — also original details. The 6 Most Stressful Cities! House Tours in Manhattan and Brooklyn for $240 dollars!! !